Happy Saints: Happy Saints "Guess Who?" Game! Here's an awesome All Saints idea from Christine Way Skinner of Ontario, Canada! Christine took a "Guess Who?" 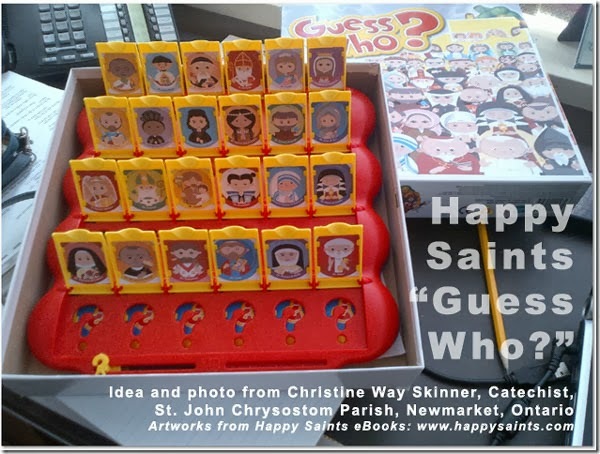 game, pasted Happy Saints badge labels over the “Guess Who?” cards and printed the matching saint cards from the ebooks. Is anyone selling the happy saints guess who game???? I would love to purchase it for my God daughter for Christmas. Instead of who committed the murder, who committed the miracle.